This is cute and even cuter with a Guinea Pig head under it. 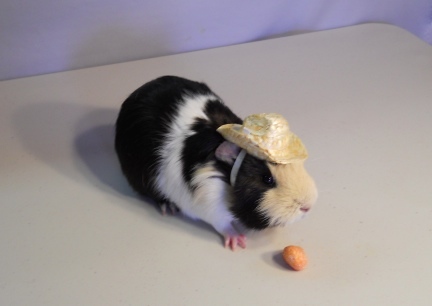 It is a Cavy sized cowboy hat. It stays on your pet's head with elastic. The elastic is left long when it arrives to you so that you can cut it or tuck it to fit your own Guinea Pig. If you have a dark colored Guinea Pig, use a permanent marker to color the elastic. Just let it dry well before putting the hat on your pet. 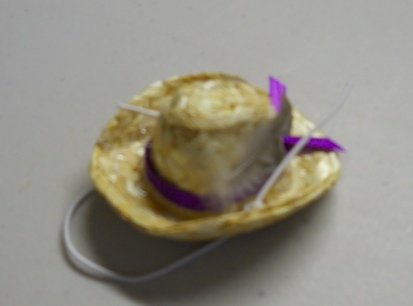 This little Straw Cowboy Hat has a Purple Hatband and a Brown Feather. Once the elastic is cut to your Guinea Pigs size the feather will show up better. This cowboy hat comes from NW SD where people wear cowboy hats all the time, even in today's world. Not only will you still find many cowboys rounding up cows and sheep our on the range; any day of the week you will find people, mostly men, wearing cowboy boots and cowboy hats and spurs at the Spearfish, SD Wal-Mart and other stores in the area.